The gantry slewing crane, utilized for the loading and discharging of ships along the pier, was built in 1985 by the Krupp-Ardelt GmbH in Wilhelmshaven. It has a load capacity of 5,000 kg, its boom is 25 meters long. The last operator of the crane was a company based in Nordham. 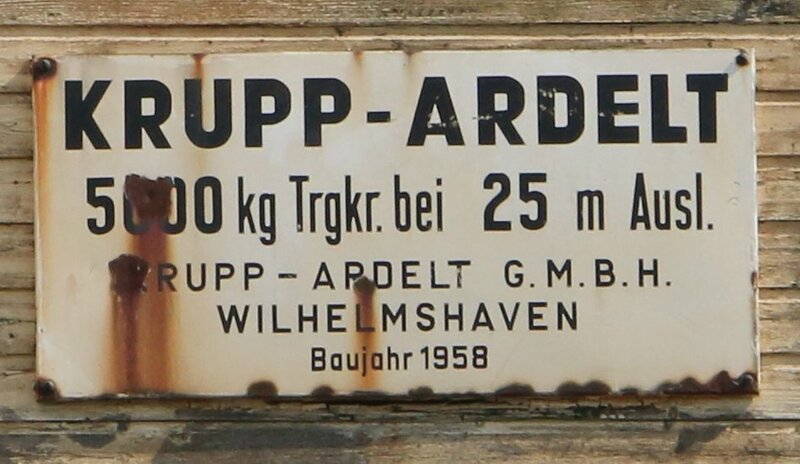 After this company relocated its domicile, Horst Werner, captain and ship owner from Elsfleth, acquired the crane with the aim of maintaining it as an industrial monument. 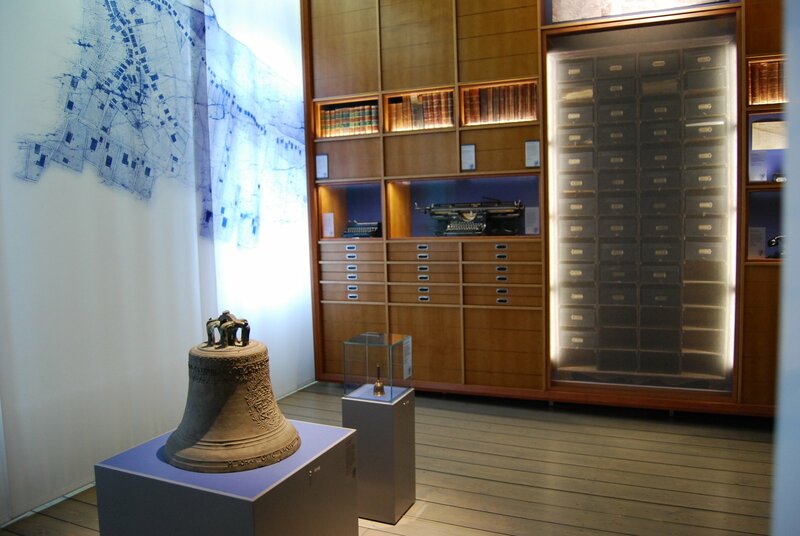 In 2012, Lower Saxony´s Office for the Preservation of Monuments recognized the economic, historic and technical significance of the object and listed it officially as a cultural monument. Elfleth´s harbor and it pier developed steadily since the 16th century. During the boom of the sailing ships in the 19th century, the harbor was a bustling place of business. Indeed, as early as 1858, some 122 sea and 267 coastal vessels were berthed along the quay. In 1872, the traffic connection established between the harbor and the railway line was improved. A few years later, in 1876, an inland harbor was built south of the current quay, although this was filled up again in 1902. Ever since the Weser Correction in 1895, as the connection between Elsfleths harbor and the Weser was severed, a major crisis unfolded. Moreover, given the decline of the sailing ship industry, many local shipyards found themselves in dire straits. The once bustling harbor nearly resembled a ghost town. In the hope of working against this trend, the Herring Fishing Association was founded in 1896 on the north side of the city, along the Westergate. In 1909, the tidal harbor was expanded, in 1916 the shipyard Elsflether Werft AG was established. In spite of these and other efforts, the facilities deteriorated even prior to the outbreak of the Second World War. Indeed, in 1936, the pier facility in the tidal harbor was completely closed down. Following the Second World War, the harbor once again became the lifeline of the city. First, however, a comprehensive program of reconstruction was necessary. Even though many of the harbor facilities had hardly been destroyed during the war years, the siltation in the tidal harbor had reached extreme proportions. Moreover, the railway quay had virtually collapsed, and there was barely sufficient space along the one hundred meters of the State Quay. Subsequent to lengthy negotiations, a modernization of the harbor began in 1951 and 1952. 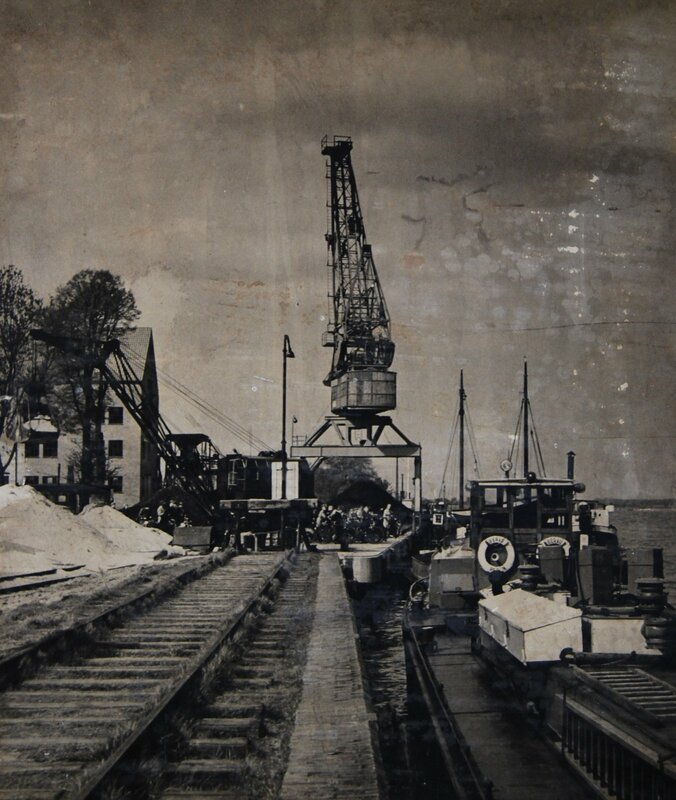 In 1956, the harbor of Elsfleth contained the following equipment: a quay measuring 110 meters and being independent of high water, a gantry slewing crane – the predecessor of the current monument – as well as 12 “Dalben” or mooring dolphins, the pier of the Bremer-Vegesacker-Fischerei AG extending for some 210 meters along the north end and the wooden pier of the wood impregnation plant on the south end. Up until 1970, the State Quay received three new railway connections, each was equipped with three gantry slewing cranes. In addition thereto, private pier facilities of local companies supplemented the State Quay. The transshipment volumes soon rose to admirable levels, 515,000 tons (1955: 209,000 tons; 1960: 284,000 tons). Elsfleth´s harbor experienced a period of growth up until the 1980s, however, the decline followed. Transshipment volumes fell continually and were ultimately halved, amounting to 235,730 tons in 1990. The gantry slewing crane was specially designed for the loading and discharging of vessel along the pier and is a trademark of the company Krupp-Ardelt. It was built in 1958 in Wilhelmshaven. The old crane has a carrying capacity of 5000 tons with an outlay of 25 meters. In the meantime, it is the last of three such cranes which remind us of the work carried out in Elsfleth´s harbor in days gone by. In 2012, the Lower Saxony Office for the Protection of Monuments and Site recognized the economic, technical and historic significance of the rare crane which moved along rails on the pier in Elsfleth, and it was accordingly designated as an individual monument.